The first class began with a quick practice of gyaka-zuki (reverse punch) with such a resounding kiai that must have awoken many of the local residents enjoying their late Sunday lie –in. The following hour was spent practicing individual techniques from the kata, these were to be used later during the following class. It was fantastic and enlightening to see a number of SEKU younger and junior grade karateka give up their Sunday morning with such enthusiasm for this, our first kata class of the year. With the kata consisting of only ONE stationary stance, many of the techniques were practiced in KIBA-DACHI (straddle stance) alone. All students embraced the basic training with the anticipation of learning or revising the so far un-revealed kata to come. After a well-deserved water break, it was back to the dojo for one of the most important part of the day, the course photograph courtesy of Ken Lyons. Hopefully Ken managed to catch my good side. It was now back to the task in hand, TEKKI SHODAN. To assist the students new to this kata, the class grades were mixed to enable visual assistance to those who didn’t yet know the kata. We practiced the kata move by move and broken into individual parts. As we progressed through the individual sections, constant recap from the beginning ensured the flow of the kata was maintained. You would think that with almost 47 years of karate I would be passed surprises but not today. Within 45 minutes even the youngest student along with junior grades, ALL those training were able to complete TEKKI SHODAN with minimal assistance. The final action of the class left the black belts to successfully demonstrate the kata to the rest of the class. Here are some comments from students attending the class. Crofton School of Shotokan Karate. 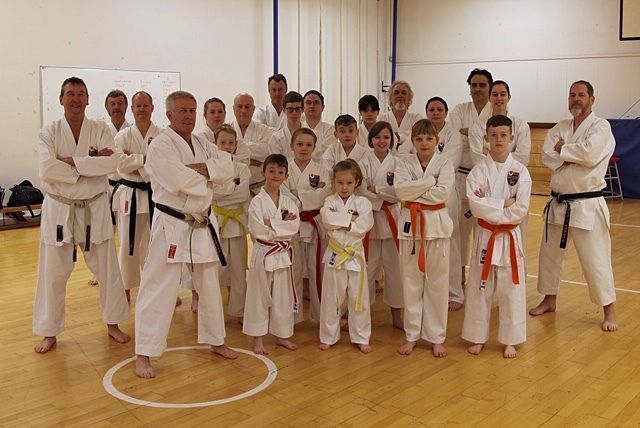 “Both Elodie and I enjoyed the Kata Class. Elodie said that it was hard work but she liked working with people from other dojo’s. Mother and daughter from Crofton School of Shotokan Karate. The future of our karate, SEKU karate, is looking bright if the students training today are anything to go by.